The food was ranged and always found something we liked to eat. Even if the food was a little cool, which they end to like they also provide a microwave. Ideally situated at the bottom of the slopes and ski depots. The staff were polite and the room service was excellent, we did not feel the need for a safe and gave a good tip for their respect. Entertainment was simple, an electronic casino, small games area, and of coarse swimming pool, hot tub, gym. We had heard all sorts of bad stories and were very relieved when we got there and found them to be very un justified. Food very basic and often ran-out, so don't be too late for your meals as you will have a diminishing choice. But generally of reasonable quality and very edible. Hotel was fairly clean and the rooms were well maintained by the cleaners. The hotel is about due for a major overhaul as it looks and feels very tired and outdated. Location was superb, fall out of the hotel doors and onto the ski slopes, what could be better. Hotel staff unfortunately were generally very cold and miserable I think this is probably because they were working 15 hours a day. Still looking for the entertainment in the hotel, but there is loads in the resort and no problem taking the kids in anywhere and I mean anywhere. 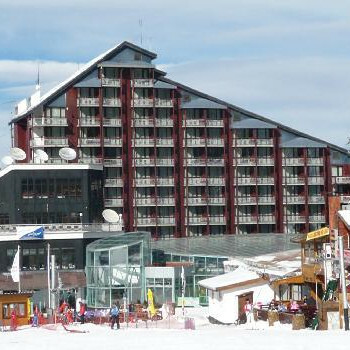 The location of the hotel was perfect straight on the slopes you could practically ski into the bar for apres ski. The food was very basic but edible a lot of it was local cuisine. You don't expect a roast dinner in Bulgaria. A meal was also available to us when we arrived at our hotel at 1am. The staff at the hotel were very unhelpful but the staff at the restaurants and bars couldn't do enough for you. A very warm welcome. We were a large party and everywhere people went out of their way to accommodate us. The entertainment at the hotel was none existent but everywhere you went there was either music or a live band. What more could you want. Borovets and the Rila will be the Ski Holiday Aiya Napa of the world before long. The sad thing is that the holiday was spoiled by the couldn't care less attitude of the staff. Ask a question and the answer is a shrug or 'I don't know' before they walk off. Couldn't help feeling they were worked like dogs and were depressed. A group of 11 friends stayed at the Rila in 2004 and 2005 snow boarders and skiers. The Nielson reps were a good laugh.The hotel was clean and the bar WELL stocked.We had a birthday while there and the chef made us the hugest cake.The food wasnt great in the hotel .One of of us got a Borovets Bottom but one out of eleven ain't bad in my book. The food was fab and seriously cheap in the restaurants and bars.The rooms had been updated when we went back the second time We all loved Borovets and thought the Rila was good (certainly for the money). There are prostitutes in the lounge but they don't hassle any one and make for good people watching when you are too tired to ski any more.